The Clamp-It – Drummer Mic Stand Holder The Clamp-It for the Singing Drummer is a unique product created by a singing drummer to assist the singing drummer, or drum clinician, with microphone stand placement. Mic stand placement is a problem that drummers face not only with regard to location and available space, but also with regard to balance and sturdiness. The Clamp-it’s unique patent pending hexagon design prevents mic stand and accessories from swaying and slipping from side to side eliminating the need for additional locking clamps traditionally used with round hardware. The Clamp-it is the only product available that solves all of these issues. Since you can use any mic with The Clamp-it, it also eliminates the need to use annoying, limited quality, headset microphones. Shipping to Contiguous USA only. The Clamp-it attaches to the base of any drum seat on the market, including hydraulic thrones, with a custom high grade aluminum clamp. Read More Below. Another clamp is attached to the opposite end of a 24″ hexagon bar of the same high quality aluminum allowing the user to select the distance of the mic stand from the seat. The Clamp-it will securely hold virtually any mic stand. It can be adjusted to bring the mic stand right up to the back of the drum seat for use in small venues or fully extended to over 15 inches from the back of the drum seat. The Clamp-it works best with a mic stand that has a telescoping boom with goose-neck extending over the drummer’s head holding a microphone securely in place; however, The Clamp-it will support most mic stands. 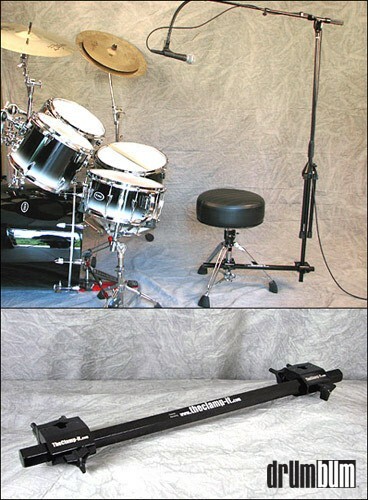 This gives the drummer the flexibility to use any type of microphone or mic stand desired. All surfaces of The Clamp-it are hard anodized black for a smooth, durable, satin finish. Each clamp is custom machined from billet extruded 6061 aircraft grade aluminum. The Clamp-it is precision engineered for optimum performance and longevity. Approx. 24″ L.
This item will be drop-shipped from another location. Please allow 1-2 weeks for delivery. Shipping to Contiguous USA only.